Mac OS X, PC Windows 10, iPhone, iPad, Linux compatible. Software with no installation ! 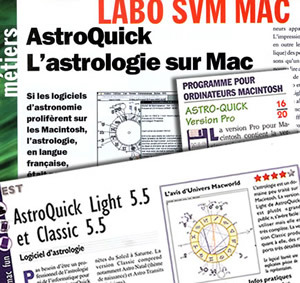 AstroQuick softwares were the first multiwindow astrological applications, released on Mac in 1993 and on PC windows in 1994. Several versions was released and the 1999 versions PC 2.3 and Mac 5.6 have really been successful during almost a decade. After many years of hard work on about a dozen of different open source development softwares, the last version 7 was released in 2009. In the end, this software is cross-platform, universally compatible and identical on PC, MAC, Linux, iOS or Android. That's a big deal since AstroQuick 7 is the first cross-platform astrological software that does not need to be installed ! Sky charts for the last 20 years! When it comes to graphics, AstroQuick softwares have been really successful with the media. In fact in 1993 AstroQuick Mac sky charts were illustrating books and papers very easily with a simple copy/paste command. 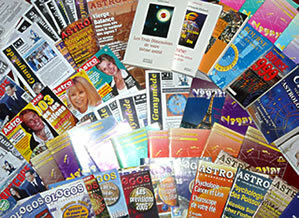 Nowadays AstroQuick is still used by several magazines and famous writers or editors of astrological books. The version 7 will allow you (in both low and high resolutions (screen and printed), to work with all the graphic softwares on PC MAC LINUX and tablets. A software adapted to you! 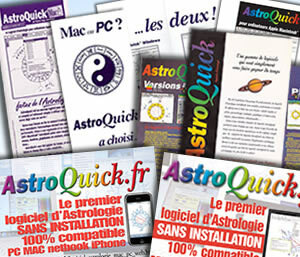 AstroQuick 7 is full of knowledge and astrological techniques and made it through the years thanks to the experience of its users. The last version gathers the best functions of the previous versions PC and MAC, with a new cross-platform interface. 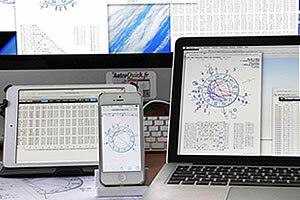 AstroQuick 7 is not only an upgraded astrological software but also a unique IT development, completely independent from the system of your computer. A software that is always compatible, that will never cause any technical difficulty, whether by updating your system or by getting a new PC. A true IT revolution that will allow you to practice astrology with no real technological knowledge. A software that is not only astrological ! Contrary to most astrological softwares, the Astroquick softwares have always taken into account IT codes. A user who use to practice astrology on other softwares will find this one to be logical with identical applications. That's a little tip to make Astroquick softwares more accessible and professional, as a matter of fact the softwares got the best grade by the IT media in their specialty. A software that you can also improve ! Since the first version version, this has been our motto : to meet the expectations of the users, even the toughest ones, while we keep this software accessible and easy to use for anyone. Here are a few comments of users of the AstroQuick 7 software. The Astroquick software is really cool, I am definitely keeping it ! Isa. Very nice presentation, design and simplicity. Congratulations ! Veronique. This software is really successful and easy to use. Congratulations to the designers !! Francoise. The software Astroquick 7.4 is really fantastic and simple with all the main functions I need, I highly recommend it, thanks to the designers!! Veronique. ...I am used to working with softwares on Mac, and working with this particular software was a great experience : straight to the point, pages pop up very fast, the core interpretation is logical, and the quality of the PDF is amazing... a keeper ! Daniel. ...your interface is revolutionnary, congratulations ! Robert. ...successful application, especially this vertical menu that looks like a remote and the easy access to windows. Francois. ...really amazing, it also works by dragging the PDF onto the window. In fact in the layout the charts are perfect and better than jpeg pics, we can zoom in and the PDF (final) always keeps the same size ! Super ! Helene. Thanks for the updates as for the city search... it works perfectly ! Francoise. Thanks for your advice, indeed by opening Astroquick in my bookmarks I don't need to type my login and password anymore... Patrick. At first it was hard for me to get used to a new sky chart but now I must say it is much easier and nicer than the previous one ! Your enter field for the birth data is really incredible ! Christophe. I could save all my charts on the PC... very easily... Congratulations and thank you ! Michel. Thanks for your explanations, I never thought it would be that simple... took me a while to realize I did not have to install it !!! (software with no installation) Beatrice. I looked what you did on solar and lunar returns, it is great ! I just need to get used to this upgrade, but I am sure it will happen quickly... Congratulations anyway... Jean-Pierre. Thank you, everything works perfectly. For once I won't spend hours trying to resolve a problem. Again...congratulations ! Patrick. Thank you for this new Astroquick MAC, I was afraid I had to switch to PC :-((( ! Martine. Thanks for this software, compatible with Windows Vista ! On my big screen I put the natal next to the return... I can work without printing... it's amazing ! Francoise. My old Mac could not take it anymore... I am happy I chose Astro Quick... in 1995... avec Kiron (Chiron) and Ceres on the sky chart, nothing's missing ! Jean-Claude. ...I discover the ephemeris in a beautiful window... better presentation than the previous version with no cost whatsoever ... Congratulations and thank you ! Antoine. Really amazing these new menus with the comparison charts, I can't wait for the transit calculations to be released ! Bernard. ...with my iPhone I make a celebrity search and I have direct access to their charts and bio, it's like a powerful astro-encylopedia ! Daniel. ...the new transits and directions in one single list; one word : yayyyyyyyyyy ! Congratulations, it is really amazing ! Emmanuel. AstroQuick 7 users, don't hesitate to tell us what you think about it ! Your opinions and critics are welcome ! Thanks for telling us how you feel by using the article "report a bug...' in the menu "AstroQuick" !